Interactive video is a new way to boost sales, educate customers and engage viewers with unique, engaging branded entertainment. These input-driven videos allow viewers to click, shop, and explore content directly within the video itself, taking the capabilities of video marketing to a whole new level. If you’re thinking of adding interactive video to your marketing efforts this year, you’re not alone. Many companies are using or planning to use interactive video in their 2018 marketing strategies – and for good reason. Interactive videos earn 66 percent more engagement and 44 percent longer viewing time, and are 32 percent more memorable than non-interactive ads. Finding the right agency partner is a critical initial step in the process of creating your first interactive video. You should pick a partner whose experience, skills and capabilities align with your needs. So, we decided to create the handy guide below to ensure you pick the agency that’s right for you. Because interactive video is clickable, it is a great media for quiz-style engagements. Videos can ask viewers to answer questions, and then follow-up those answers with content that explains the answer in more detail. Educational interactive videos can be impactful in a variety of applications, but one trend we’re seeing is that companies are using interactive videos both for customer education and employee training. A great example of an educational interactive video made for customers is Srvd’s interactive video. Srvd is a digital product that allows website creators to customise content placement for users based on their location, language, browser and more. Their interactive video lets visitors explore the different types of content placement they offer in a choose-your-own-adventure style learning experience. This fun video replaces what could have been verbose web copy, a customer support call or a long webinar with an interactive experience that puts customers in control, allowing them to learn only what they want and need to know. Interactive videos add a new layer of fun to an already enjoyable media. Marketers are taking advantage of this new opportunity to interact with consumers through entertaining content that increases brand awareness and gets people talking. One example of a company using interactive video for entertainment purposes is Philips. The men’s grooming brand created an interactive video to promote the Philips Click & Style electric razor. The razor’s tagline, “One click, endless possibilities,” inspired the video itself – the narrator asked viewers to select his facial hair style, each of which led to a different video experience with one click. Philips proves that interactive video doesn’t have to be a hard sell; if your video content is fun and engaging, you can build brand affinity and loyalty without pushing product. Interactive videos can drastically improve your e-commerce efforts. Research has found that interactive videos increase a consumer’s purchasing probability 9x over traditional video ads. That staggering number makes interactive video a great tool to increase sales and make online shopping more fun for consumers. JCPenney has a great example of this in a shoppable promo video. The department store partnered with Midwest vlogging team GabeBabeTV to promote home and clothing items, giving viewers the option to click on an item in the video and instantly buy it online. They were able to feature dozens of items in a single 5-minute spot, taking a simple video and turning it into an interactive digital catalog. Interactive video can add spice to the sales process, giving sales reps another tool to generate leads and have a 2-way conversation with prospects. One company doing this well is NICE inContact, a sales software company; the brand uses a simple yet effective interactive video to promote their contact centre software. Throughout the video, viewers are asked questions about themselves, like “what’s your role within your organisation” and “how many people work on your team.” This is a very strategic approach; not only is NICE inContact collecting valuable lead data, but the video then creates a tailored experience based on the viewer’s answers, showing the power of interactive video to enhance the sales process and collect sales data. As you can see, interactive video can be useful in nearly any marketing initiative if done well. One trend we’re seeing is innovative companies using interactive video to stand out as top employers and improve their recruitment efforts. Deloitte showed how interactive video can add some excitement to a recruitment campaign with their “Will you fit into Deloitte” interactive video. The experience takes viewers through a day in the life of a Deloitte employee; throughout their day, they encounter challenges, and must answer how they’d overcome them. If viewers selected correctly (in other words, in line with the brand’s existing values), they were given the opportunity to learn more about open positions. This interactive video not only added some life to what could have been a traditional, dry recruitment campaign, but also communicated about the brand’s values in a fun and engaging way. Now that you have a sense of how you can use interactive video, you should consider who you’re going to partner with to make yours. Here are a list of questions you should answer as you vet your potential agency partners. Do they make animated or live action videos? 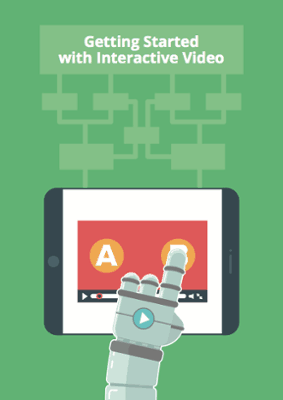 There are generally two kinds of interactive videos to choose from: animated and live action. Each style has its own unique benefits and purposes within a marketing plan. An animated video is a great tool for describing difficult concepts that aren’t easily explained with real video. They can also be hyper-customised to match an existing brand identity with custom colours and illustration styling. On the other hand, a live action video is great for showing visuals of a product, place or person that’s important to a brand’s story. You may already know which type of video is right for you. If you do, you should be sure to search for an agency that specialises in that kind of video production. If you don’t have a preference, ask a potential agency partner which method they would recommend to bring your vision to life. Interactive videos come with all kinds of price points. Simple interactive videos might only cost a few thousand dollars, while big-budget productions might cost more than $50,000. You shouldn’t expect an agency to give you an exact estimate for what your video will cost right from the get-go; there are a lot of unknown factors that take deep conversations to figure out. You can, however, ask for a ballpark price based on your individual requirements. It’s also a good idea to go into this conversation with a budget range in mind. This will help you learn early on whether there’s a good fit based on your budget and the agency’s price point. How good is their interactive video portfolio? As part of your vetting process, you should review each agency’s interactive video portfolio. In an ideal world, they’d have a video for a company just like yours – but you shouldn’t expect that to be the case. Instead, ask them to show you a video that solved problem similar to yours. For example, ask to see examples of videos created to boost sales, educate customers or build brand loyalty. You can also review their portfolio to see their range of capabilities; you want to select an agency that tailors a video to match their clients’ needs, not one that reuses the same style over and over. What kind of interactivity does their platform support? Hotspots: Hotspots within a video allow you to click links, add an object to your cart and even make a purchase. The JCPenney and Deloitte recruitment videos above both used several of this kind of interactivity tool to gather feedback and push relevant content. Branching: Branching lets a viewer create their own journey. When prompted, they can click on a hotspot to jump to a different place in the video. The Philips Click & Style video above is a great example of branching. Data inputs: Buttons and form fields within a video allow brands to collect viewer data and engage in a 2-way conversation with a brand. NICE inContact’s interactive video from above is a great example of how brands can use data inputs to collect information and customise the viewer experience. 360-degree view: 360-video lets viewers scroll left, right, up and down in all directions. Toms Shoes experimented with 360-video to give customers an inside look at the work they’re doing in Peru. Viewers could click and drag on the video itself to explore in all directions for a fully immersive, 360 perspective. Multi-stream: Multi-stream video gives viewers two alternate looks at a video to show contrast, and allows you to slide or switch between the two. An award-winning example of this technique is SPP’s “Earth 2045” interactive video. SPP, a pension company, wanted to craft a video that combined their commitment to sustainability and their retirement product offerings. The multi-stream video allowed viewers to slide between two versions of Earth in 2045, showing what would happen to our world if we don’t make smart decisions about the Earth and retirement now. As you’re selecting your video agency partner, see if they have examples of the interactivity you’re hoping to incorporate into your video. You can also ask them what types of interactivity would be best to engage your audience and achieve your marketing objectives. Adding interactive functionalities to a video can come with some additional costs like subscription fees or fees for the technology that powers consumer interactions. For example, if your video collects data from consumers through forms and questions, that data needs software and a database to make its way to you. As you’re scoping a project with your video agency, be sure to get information on any ongoing costs and fees. When selecting an interactive video partner, you want to find an agency that’s great at what they do. But almost as important is whether they’re easy and enjoyable to work with. Do your research early on to ensure you’re picking a partner who will deliver results and who you want to build a long-term relationship with. Look online at reviews, read customer testimonials, and see if you have any shared connections on LinkedIn to get to know a little about the company before you sign on to work with them. There’s no doubt interactive video is a powerful emerging trend in marketing. 78 percent of marketers who have used interactive video have found it to be an effective strategy, and interactive video adoption is expected to soar from 1 in 5 marketers currently to almost 1 in 3 in 2018. The key now is to determine how interactive video can be a marketing tool in your toolbox – and the first step is finding an agency partner who can guide you through the process. As you’re searching for the right partner, read Getting Started with Interactive Video, an e-book filled with tips and resources to help as you get started. Introducing WIREWAX - Our New Interactive Video Partner!